Thanksgiving guest post from Sue Conley of Brightandbeautyfull.com! This Thanksgiving guest post is from Sue Conley of brightandbeautyfull.com and we are kindred spirits you see. We both carry an insane number of lip products on our person and have been known to have Twitter chats where we Twitpic the contents of our handbag, pockets, desk etc to see who is the most mental of the two. As it stands, it's a tie, but that could all change in a heartbeat... The highlight of my friendship with Sue was the culmination of weeks of preparation.... We met up last week and reenacted a hug from our favourite show, Revenge. If you watch it you'll know what this means... Thanks a million Sue for this here guest post and I'll try to do you proud when I'm in your homeland! I tend to err on the side of gratitude, as I am of sincere personality, which can come across as kind of squicky and revolting. It tends to make other people uncomfortable, but sure, feck 'em if they can't take a compliment. I think there's just enough salt in my demeanor to make up for it, a ying/yang thing, that causes me to be open-minded, yet suspicious. This stands me in exceptionally good stead as a beauty blogger. In honour of our dear Karen's trip to NYC for the Thanksgiving holiday, I cast a cold yet hopeful eye over a variety of travel sets that cover a variety of length of days away, and, ahem, a variety of circumstances. THE DIRTY WEEKEND During which time, paradoxically, you would like to be clean. 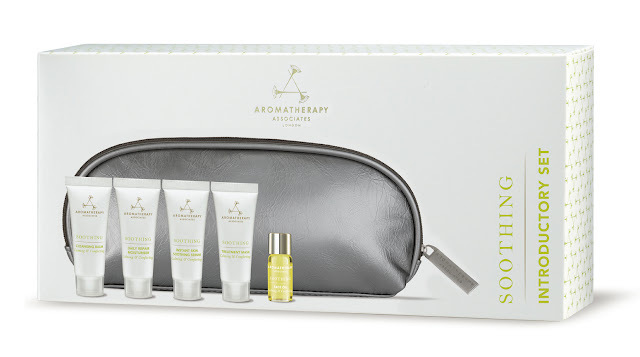 Aromatherapy Associates offer up their Soothing Introductory Set (€39.50; millies.ie) probably not as a way to keep your skin fresh and supple over a long randy weekend, but their 'serving sizes' are perfect for three to four days in which one needs easily portable skin care. Included here is moisturiser, cleansing balm, serum, a treatment mask, and face oil. That pouch is clever, and the smallness of the sample sizes allows one room to lash in other necessaries. The smallness of the sample sizes is an issue regarding price, but the quality of the product is such that the auld truism rings, well, true: the posher the product, the less you need to use. I found the serum to be especially good value, and the face oil is the business. THE LONG WEEKEND, DIRTY OR NOT This Organic Skin Care Collection from Pukka Ayurveda (€30) could easily stretch to five days. I'm imagining a cottage down the country, with long walks during the day, and longer nights in front of the fire, sipping on the uisce beatha after having eaten a really nice meal, cooked by someone else. There you sit, smug in the knowledge that you'll be tending to your skin with product made from sustainable ingredients, products that contain nary a petrochemical. You've got your day cream and night cream, a serum and cleanser, a toner and a wee packet of face oil. Can't imagine needing more than that. The brand may be known to most as a purveyor of teas that align with one's ayurvedic body type. A while back, I tried their Nourishing Face Oil with Organic Rose Otto, Avocado & Pomegranate, and did mot like it muchly. I wonder is this one of those lines with which you must use all their own products to get the best result? I do like the serum, and the toner, so the next time I am invited to a cottage down the country, I'll give the whole kit a whirl. THE TEN DAY TOUR Tour of wherever, it doesn't matter, and in fact, it may be that you are going to two places in the ten days! You lucky cow! 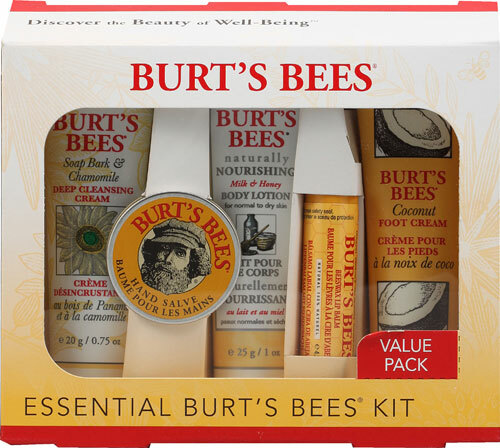 I don't know how much a cow likes a bee, but the Essential Burt's Bees Kit (€15.95), is… essential for a journey of medium duration. Now, the contents are slightly eccentric when you think about it. Cleansing cream, hand slave, body lotion lip balm, foot cream? Perhaps you are going rock climbing? I don't know. I do know that the lip balm is worth the price of admission, as is the foot balm. This is saying something because I think feet are gross and don't even like touching my own. Gross! But I apply this with abandon, so believe me, it is good. The sample sizes are of the perfect mls to get you through a week and bit. THE FAB FORTNIGHT I have only recently comes across the Korres brand, and Best of Korres (€23; oliverbonas.com) seemed a terrific way to familiarize myself with their work. Begun in a homeopathic pharmacy owned and operated by Giorgio Korres in Athens, their Wild Rose 24-hour Cream was their first global best seller. You will find a sample of this in the box, a sturdy box that will stand the test of luggage-time without flinching. Also inside are 50ml samples of Guava Body Butter, Basil Lemon Shower Gel, Vanilla Cinnamon Shower Gel, and Evening Primrose Eye Cream. Could have done with only one shower gel, frankly, and maybe have replaced that with a serum — I am a serum addict — but otherwise: 50ml samples! Astonishing! You could take them with you when you go to visit Greece! That would be totally appropriate and also crazy! And if anyone else is traveling to New York over the Thanksgiving holiday, here's a Pro Tip from someone who knows: the night before the big Macy's parade, the hot air character balloons are blown up near the Museum of Natural History on the Upper West Side, in the environs of 79th and 81st street. The balloons are iconic, and the best thing about the parade, IMO. Being able to see them at up close and personal? Coolest. Thing. Ever. Sue Conley blogs over at brightandbeautyfull.com. She is also the author of Drama Queen and The Fidelity Project, both available for order online, and for download, too! wow.....It's amazing.....I like it very much.